Gifts in a jar are fun to make, and are a great go to gift for last minute needs. We found several gift in a jar recipes last summer for wedding shower gifts, and they were a big hit. I have several cookbooks on the subject, but when I needed to make these, I couldn't locate them so I went searching the Web, and found some good ones. 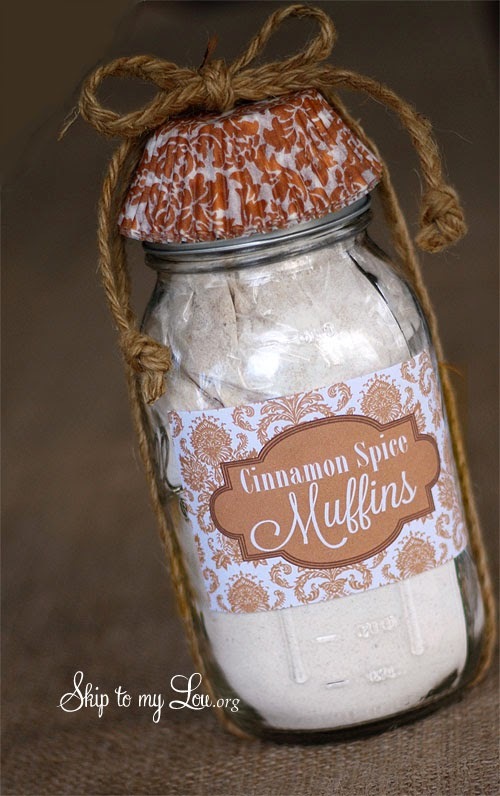 Cinnamon spice muffins in a jar from Skip to my Lou were wonderful. I don't know how she was able to do the muffin liners and cording around the jars, we tried every way possible, and ended up just putting fabric over the top and tied with a ribbon. The best part about this, is that she includes a printable pdf file for the label, and recipe to print out. They were so easy to do, just follow the ingredient list, layer into the jar, put the topping mix in a baggie, put the lid on, print the label and Presto, a ready to give, straight from the heart gift in a Jar! Here is the website that I found it on, I hope you like them as much as we did. They would make a great teacher gift for Valentines day coming up!